Ingredients for cooking Roast Potatoes A traditional favourite - not something for every day, but great occasionally. These work very well with my Roast Beef. The trick is to cook them entirely in the oven - none of this par-boiling stuff. This takes longer, but is not a problem if you are also cooking a roast joint or chicken. Peel enough potatoes for you and your guests - be generous, since they will love them! Choose a variety suited to this cooking method. 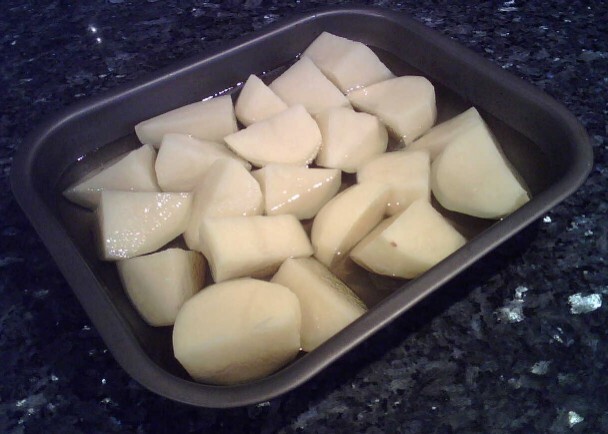 Cut the potatoes into pieces about 3cm (max 4cm) on a side - make sure that every piece has at least one curved surface. Use a non-stick metal pan big enough for all the potatoes, and pour enough vegetable oil (not olive oil - it will burn at these cooking temperatures) to cover the pan by 5-8mm (say 1/4 inch). Put the oil (only!) in the oven to get thoroughly hot for at least ten minutes. Thoroughly drain the potato pieces. Using a pair of tongs, put the spuds in the hot oil (carefully!) - this is important! - place them curved side down. Shake (gently!) the pan to get the potatoes covered in oil, then return the pan to the oven for at least half an hour. Take the pan out, turn over all of the partially cooked spuds, then back into the oven for at least another half an hour. When cooked, remove all the roast potatoes with tongs and drain on kitchen paper. Serve with traditional roast meats, two vegetables and gravy.